When the first graduates of the First Nations Governance and Public Administration program walked across the stage at Yukon College to receive their certificates in 2013, Tosh Southwick, Director of First Nations Initiatives and Academic and Skill Development at Yukon College, says she felt proud. The Yukon College First Nations Governance and Public Administration (FNGPA) program bridges divides and creates a space for Northern students to excel in their jobs. The innovative, university-accredited program is the first of its kind that focuses on providing the knowledge and skills to build First Nations governments and implement land claim and self-government agreements. “Seeing the expressions on their faces and watching where they’re at now, that was definitely a huge moment for me,” says Southwick, a citizen of Kluane First Nation. With a core of ten culturally-relevant public administration and governance courses, plus two optional electives, the certificate is building the skills, education and hands-on training needed to implement Yukon’s unique governance model. Eleven Yukon First Nations have signed land claim and self-government agreements, more than any other jurisdiction in Canada. These agreements pave the way for a new way of governing, but they take work and knowledge to implement. A lot of that negotiation and self-governance knowledge rests right here in Yukon. The curriculum is based on the lessons learned from over 20 years of self-government implementation. Students come from all walks of life, some just starting their career, others with years of experience. The program is “based on applying and bringing the students’ real-life experiences into the classroom,” says Southwick. Many students are actively working for a First Nation, territorial or federal government. The program offers an opportunity to learn from each other and share the lessons and challenges of their governments. “We have students who have worked for their First Nations government for 15 plus years, and their expertise and knowledge is so incredibly valuable for all of those students who are in that classroom,” Southwick says. The program started as a pilot project with the Champagne and Aishihik First Nations (CAFN) in 2007. Its goal was to build the knowledge and capacity of CAFN senior staff. With support from the territorial, federal and First Nations governments, the pilot project expanded to employees of all First Nations, and then Indigenous employees of the Yukon and federal governments. Now it is open to any interested individuals. 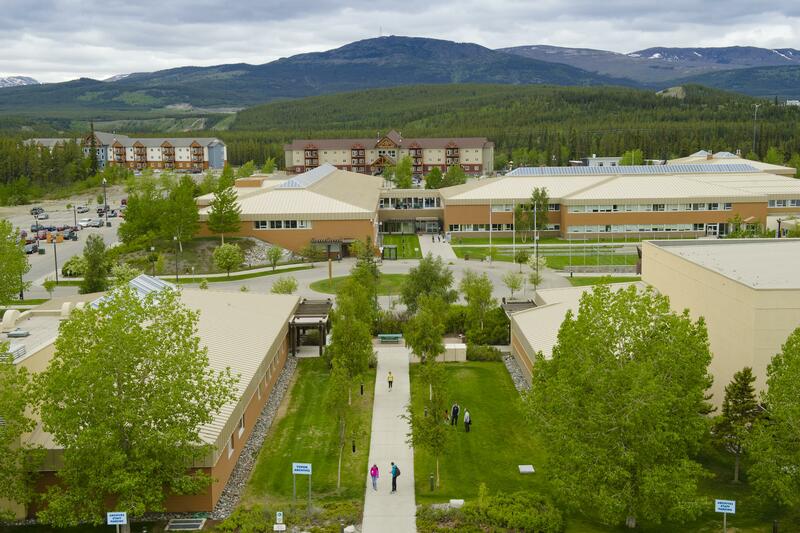 There are plans to expand the program to a full degree program, which would make it Yukon’s first home-grown university degree. “It’s created a model of partnership and pushed the boundaries on how academic institutions normally partner with First Nations. It’s also been a huge success in terms of the students. The students are gaining relevant skills that they can apply in their communities immediately. Anytime we can build capacity in the territory to implement our Agreements, I would call that a success,” Southwick says. With the Final and Self-Government Agreements in place it’s important to “make sure that all members and orders of government have a background in the Agreements and can work together to implement them,” she says. “There is no other program in Canada that really helps both First Nation and non-First Nation people implement self-government agreements,” Southwick adds. Blazing a trail in the academic world, the program is “totally immersed in First Nations and Northern relevance and that can be hard to find as Northerners... everything from the entrance requirements, to the way that we evaluate has really been based on what’s best for Northerners,” Southwick says. Cynthia James, a citizen of the Carcross/Tagish First Nation, worked for the Ta’an Kwächän Council before deciding to spend part of her time in the program. The program allowed her to continue to focus on her children, yet build on her professional goals. “It really fit my needs…it covers all aspects of how First Nations governments are set up,” James says. She says the program gave her the freedom to explore new ideas as a Northerner. “In the program we were able to dream and I think that really motivated each and every one of us to go back to whatever our jobs were and have a bit more freedom…it’s a groundbreaking opportunity. This course, which is moving toward a degree program, moves that whole idea along that we’re capable. This is accredited and I can use these skills working across Canada,” James explained. With almost half of all comprehensive land claim and self-government agreements in Canada, the innovation of the program mirrors the innovation of Yukon governance itself. “[With] our governance processes, we are making history everyday because there are no other governance processes like it,” James says. Lisa Hutton, a Tr'ondëk Hwëch'in citizen, graduated from the program in 2015. Hutton currently works with Indigenous and Northern Affairs Canada as a negotiator on program and service transfer agreements. She says the program provides a good foundation for understanding Yukon and the fundamental role the Agreements play here. “It’s about the building blocks that set the foundation of our Agreements and the various programs that touch on different parts of those Agreements. It’s about the history of the Yukon, the goals and objectives, and it’s about understanding how everything works, and how much more work there is to do. That’s why I think this program is important to build understanding,” Hutton says. “I think everything about this program speaks to reconciliation. The concept of building in partnership is reconciliation. The concepts embedded into the course about how do we govern together is reconciliation. How do we acknowledge the inherent rights of Aboriginal people in Canada as we move forward in our next 150 years is reconciliation. Understanding the colonial history of how we got to where we are is reconciliation. Making sure that students understand the impact of things like the Indian Act and how to get around those colonial tools becomes reconciliation,” Southwick says. “Working together, I think we are just able to do much bigger and better projects that benefit all Yukoners, not only the First Nations governments and communities, but Yukoners as a whole. This program is one of those areas where it really highlights how working together really advances self-government here in the Yukon,” Hutton says. The program helps create understanding of the “benefits that these Agreements bring to the Yukon and not just to First Nations, but to all Yukoners and even Canadians,” Hutton says. “It is about, being able to walk into a room, with differing worldviews and understand that we are all there for the same goal,” she says. “I think it’s better for all Yukoners because we are working together for the fulfillment and betterment of all Yukoners. When the First Nations flourish, the Yukon flourishes and Canada flourishes,” she says. Even though implementation of the Agreements takes work, the First Nations Governance and Public Administration Program is making it a little easier by sharing knowledge and building understanding.